In my last posting I showed how to quickly create an empty Sage 300 Web UI by running our two new wizards from Visual Studio. In this article we’ll look at how to add some visual controls to this project and talk a bit about some of the issues with doing this, namely about using our provided HTML helper functions and CSS styling. ASP.Net MVC Razor Views are a technique to dynamically generate our HTML by embedding C# code in an HTML template. When the HTML needs to go to the browser the C# code is executed and it usually generates more HTML into the template, so that pure dynamically generated HTML is transmitted to the Browser. The Razor View system is very extensible and it allows a lot of extensibility which we do by adding a large set of helper functions. (That didn’t work so well. Apparently WordPress ate all the div’s, I’ll do a bit of research to see if I can fix this, so a bit is missing from the below code. I also added some line breaks so the code doesn’t go off the right of the page). I put comments around the code I wrote so you can see what is generated by the code generation wizard versus the code you add later. Basically this is a mixture of C# code (each line starts with @) and HTML which is in the angle brackets. There isn’t much layout in this file because this is handled by the CSS. For simple screens like this one there are sufficient styles in the provided Sage standard CSS file that we don’t need to add any CSS. As a result, the HTML is actually fairly simple and really just used to logically group things. Notice that we use Sage provided extension functions to create all the controls. This provides us with the hooks to provide quite a bit of standard functionality. For instance, we don’t want any hard coded strings in our HTML, otherwise we would force our translators to produce a different copy of the HTML for each language and then we would have to maintain all these files. Here we just use the helper function and it will look up the correct string from the language resource appropriate for the user’s language setting. This also gives us the ability to change the underlying control without changing all the HTMLs. So we can use a different date picker control for instance by changing the code our helper function emits rather than editing each HTML individually. Basically giving us a lot of global control over the behavior of the product. These helper functions also can setup databinding. Any helper that start with ko will bind the data to the model (more precisely the viewmodel). We used ko since we use knockout.js for databinding which perhaps isn’t the best choice of function naming since again we can change the mechanism in the background without effecting the application code. 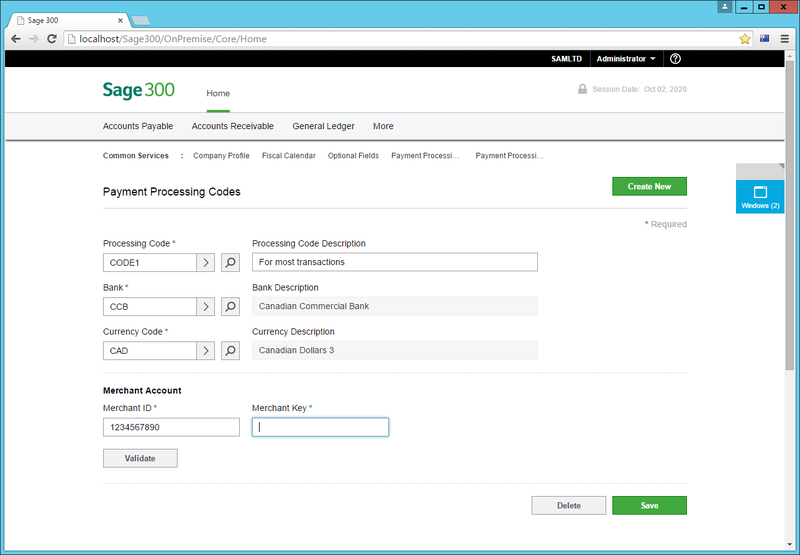 Sage 300 has always provided an SDK to allow ISVs to create accounting applications in the same way that we create our own applications like General Ledger or Order Entry. In the past our internal application developers have usually only had the SDK installed for doing their own work. Further these ISVs can install their applications into a working Sage 300 installation by just copying a specific set of folders. We then will see these folders and allow that module to be activated and used. The new Web Screens will have the same ability to create custom accounting applications and to easily add them to one of our installations. We will be starting the beta program for this SDK shortly, so this should start to give people a preview of what is coming. This overview assumes you have an existing SDK program. That you have Sage 300 Views and VB UIs. 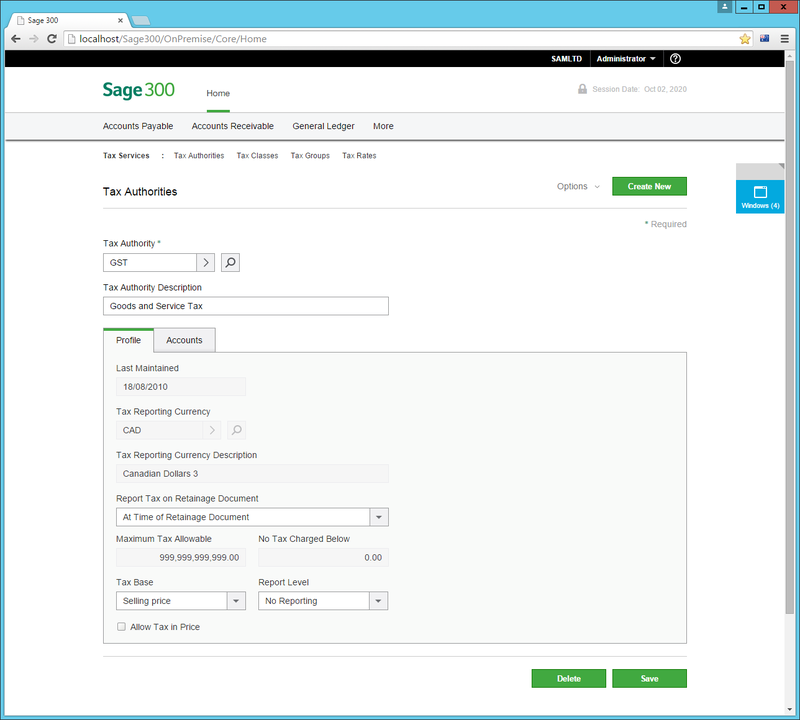 That you have an activation UI and can activate your module, making it known to Sage 300. This is just how to create the actual Web UI components. We are first going to create a Visual Studio solution for your Accounting module. Then we will use another wizard to add the screens to this solution. The solution will contain several projects that correspond to the parts of a UI screen. This is different than each screen having its own project. This stays in tune with how the ASP.Net MVC tools create solutions and allows us to leverage everything built into Visual Studio. The wizard will then ask you some questions about your module. And then create a solution with the correct project structure for your application. This solution now has the correct structure to add screens to, plus it has all the module level compents and references. This will compile, but there isn’t anything to run yet. Now you create your separate UIs by running our Code Generation Wizard. You get this by right clicking on the solution and choosing it from the context menu. This then brings up a wizard that you can step through. The View ID will be used to generate the model and business repository for this screen. Basically it will use the View meta-data to generate C# classes that will provide most of the functionality to perform standard CRUD type operations. Like all our previous SDKs there is full support for producing a multi-language product. Of course as in the past its up to you whether you leverage this or not. 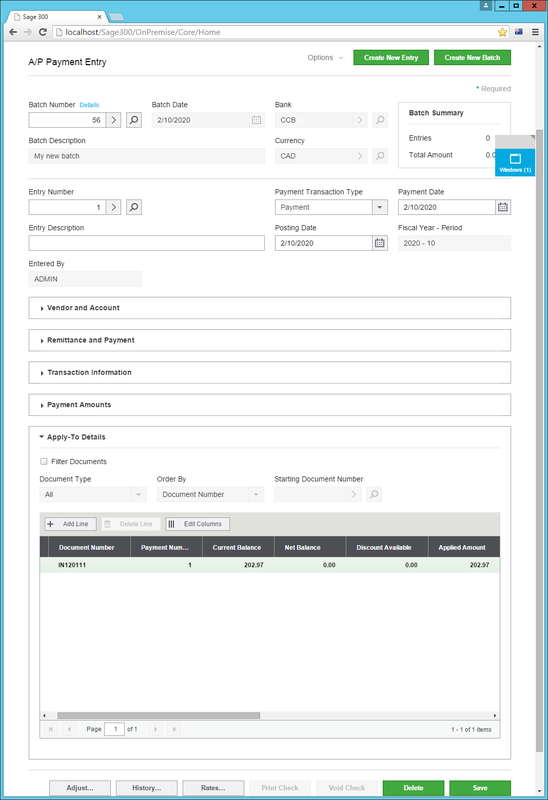 With in the Sage accounting modules the I/C, O/E and P/O Views contain more functionality for determining if a fields is editable or not than do the G/L, A/R or A/P screens. The “Generate Dynamic Enablement” indicates whether all the checking editbable is done by your UIs or by your Views. The wizard has used the meta-data from the Sage 300 Business Logic View, in this case the PJC Cost Types view to generate the code for a Business Reposity to use and an empty HTML screen. Running these wizards is quite quick and hopefully they give you a good start. The solution will compile and run, but all you get is a blank screen, since the generated Razor View just contains a TODO to add some controls. Now the real work begins adding controls to your Razor Views, adding custom processing logic and generally wiring things up. You can now use the code-debug-fix cycle within Visual Studio and hopefully find it a productive way to create your Sage 300 screens. In future articles I’ll talk about creating the Razor Views, using the extension functions we supply to help make this process easier and the CSS that is used to give the screens a standard look and feel. Then we will need to go into how to wire up finders, perform custom processing and all the other things required to make a Sage 300 screen. This was a very quick look at the SDK for our Web Screens. We haven’t covered any coding yet, but we will. All the functionality used is built into the DLLs installed with Sage 300, so the actual SDK component is quite small. Besides the wizard, there is a lot of framework support to help you with common components and abstractions to hide some of the details. 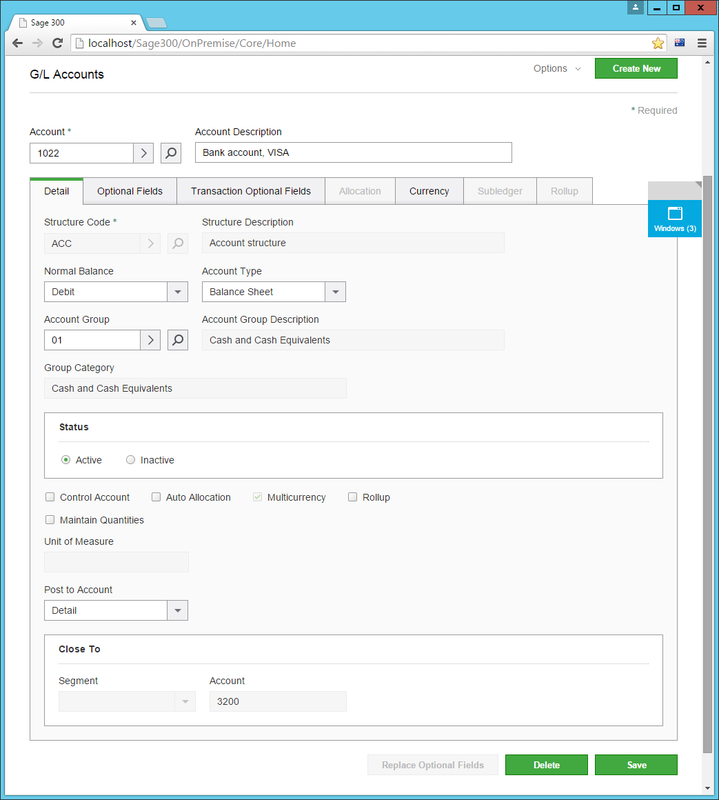 At Sage Summit 2015 we introduced our new Web UIs for Sage 300. I’ve blogged a bit on the various user facing parts and a bit on the technologies used, but I haven’t had a chance yet to get into the internals of how they work. We’ve released the Web UIs for the Financial Modules and will be releasing the Operations Modules early in 2016. With these we will be releasing our SDK as well. Over time I’ll blog quite a bit about the details of all the components, but first we need to layout the major building blocks. Below is the architecture diagram I’ve shared before which is the architecture for the main Web UIs and a block for RESTful Web APIs, but there are some other components that need mentioning as well. I’m going to start at the bottom of this diagram and work up. However there are some other components that aren’t mentioned here that we will bring in. Within our framework we provide a lot base classes that you can inherit from, so generally the only code you need to provide is where something is different than the standard protocols or behaviors. When looking for framework components to help you, besides looking for services to call, look for classes that do 90% of what you need that you can extend (inherit from). ASP.Net MVC also makes extensive use of “convention over configuration”, so for a lot of things if you follow the standards then it saves you a lot of work and makes a number of things just work magically. Similarly we do the same things, so we can find and use your components as long as you follow the standards as outlined. The Sage 300 Views are still the same. We didn’t even update the C View template for supporting this new framework. All the regular Sage 300 Business Logic (Views) is accessed through our .Net API. 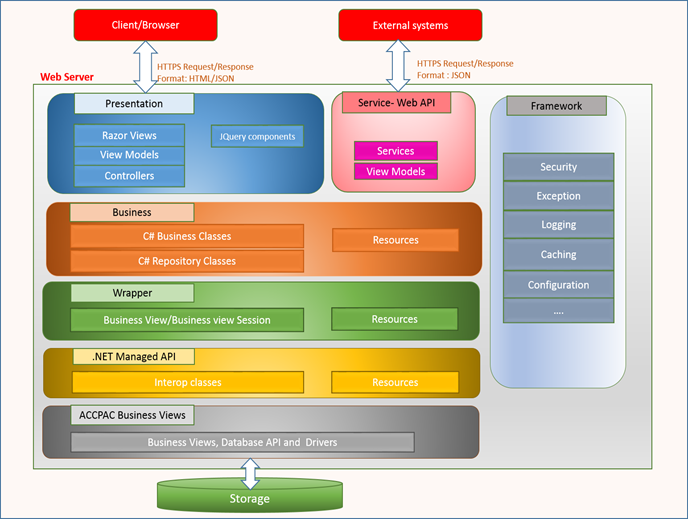 The Business Repositories convert our View API into something more like an ASP.Net MVC API. The Business Repositories are similar to the definitions that we generate from ViewDoc for different systems to make accessing all the various View fields more natural in the given framework. They provide support for all the usual View UI related items like presentation lists and field masks. Generally this is where all the View programming is placed that is needed by the UI. This makes all this programming available to everyone including UIs, standard components and Web APIs. The models are true ASP.Net MVC Models. They are typically built on a given business repository. The reason for the separation between the Business Repositories and the Models is that the Business Repositories are more general use and can easily be consumed by UI elements whose Models are more generic like for Finders or Import/Export. There are two basic ways that our UIs operate, stateless and state-full. Ideally everything should be stateless, but this becomes somewhat impractical when dealing with large accounting documents. Basically in stateless operation, each RPC operation is completely independent and can be processed with no knowledge of what’s gone before. For state-full transaction a document is built up in the Sage 300 Business Logic as the user enters the document, this is more similar to how the VB UIs work. Generally only the bigger document entry UIs are state-full now. Use of the two is similar and most of the details are hidden by which base class you inherit from (whether a state-full or stateless one), but you must beware of the context as you do your programming. Often in VB programming, you handle events from the user and as a result of a UI event you do a certain amount of View calls (perhaps say 20 of these). This sort of thing also happens in the Web UI, but we certainly can’t do 20 or so RPC calls to the server as a result of a single UI interaction. This is where services come in. Then when such a UI event is triggered, a single RPC call is made to the server, the controller dispatches this to the service who calls the correct method in the Business Repository which then makes the 20 or so View calls to do the real work. The service then marshals any returned data in the response. Of course this all happens asynchronously. Generally if you are wondering where to move your processing code from a VB UI it would be into one of the Business Repositories and then wire up a service to allow it to be called from the Browser. Services are also used to initiate long running processes which we’ll talk about later. We don’t want to run long running processes like I/C Day End or Posting Batches directly from IIS, since even with full multi-threading support this can adversely affect the responsiveness of the UIs for other users. So we run a Windows Service and when a long running process is initiated we ask the Windows Service to run it, and just return from IIS. Then the UI can inquire periodically for meter status updates and to notify the user when it’s done. There is a lot of standard framework support for doing this and you just need to setup a service to initiate and monitor the process. Generally we do this for any Sage 300 process that pops up a progress meter. KPIs are really just like any other UI. They just have a different size and are run in a different place on the Home Page. There are a few standards to follow to match the other KPIs and a few UI controls that aren’t used anywhere else, but are otherwise just standard UIs. Although this component isn’t included in the original Sage 300 2016 release, there is full support for exposing RESTful Web Service APIs. These leverage your Model code to expose the model as an API. Then there is some support for hiding inappropriate methods and adding a bit more attribute information to help users. Like previous versions of Sage 300, we use Crystal Reports to print out our reports. We basically use the same report API as we used in VB. We then have support to call this API from our UI framework and to render the report in the Crystal HTML Viewer. Then the rest of the report UI is just the same as any other UI, gathering up data from input fields. Printing might also have to initiate a process on the Windows service before printing, like generating the data for an aging report, before initiating the report. There are system components for things like Finders and Import Export. These just need to be setup and wired in correctly. Then there are components like the editable grid which requires a certain amount more support in your UI. And then higher level components like the Optional Fields Control that is built on the Grid. There are a few other controls and wrappers for things like dates, fiscal year/periods, masked edit control, drop down list based on presentation strings, etc. 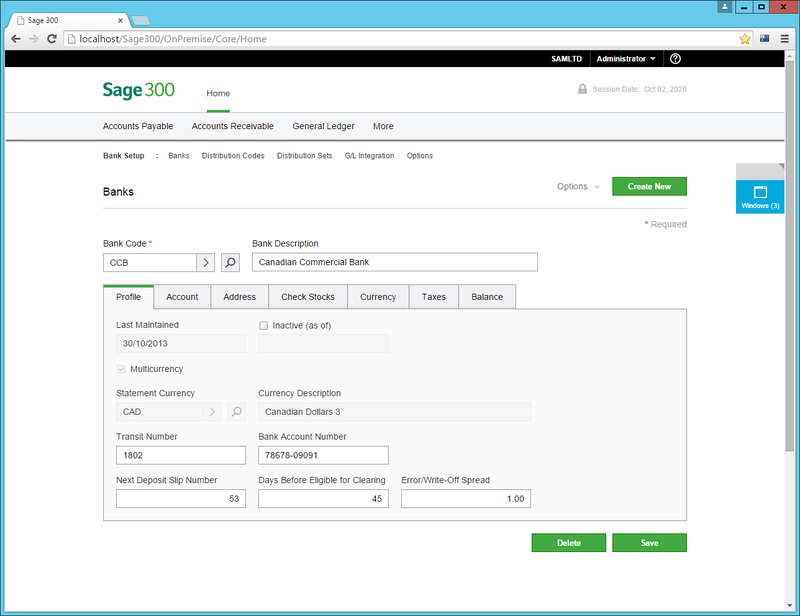 We are just rolling out Sage 300 2016 which includes Web versions of Common Services, Bank Services, Tax Services, General Ledger, Accounts Receivables and Accounts Payables. The focus of this release isn’t on a new flashy portal with flashy KPIs (although we do have those) or other new technology enabled functionality. The focus is on the core Financial Accounting functionality; on entering financial accounting documents into the system and providing the key reports that go along with these. This is the first of a series of releases that will translate the Sage 300 product line to a new Web based technology platform. It will move all the functionality of Sage 300 to this platform and use this new platform to add newer technologies and functionality. This article is meant to give a quick overview and flavor for what you will see in our new Web UIs. A lot of Common Services are screens that enable functionality through the rest of the product. For instance the Optional Fields setup UI is present and is used to configure Optional Fields that then appear in so many other places. There are the usual basic common setup UIs for Company Profile and Calendar Services. Bank Services is a part of Common Services and it provides a centralized place to manage your bank accounts. Reconcile bank statements and enter various bank related items like service charges. It also provides a common check printing UI for other applications to use when printing checks. Tax Services is another part of Common Services that lets you configure your sales taxes in a single place and then they are used everywhere that involves sales taxes. You will see the full tax services support though out many Web UIs. Sage Payment Solutions (SPS) is also configured from Common Services. We fully support Sage Payment Services for taking credit cards in A/R as part of this first release. We integrate to the Web versions of the SPS screens to take and process credit cards. As before no credit card information is stored in the Sage 300 database, its all handled by the SPS screens and saved in the SPS vault. Although they aren’t supported by their own screens there is a lot of common functionality that goes across all the modules like Import/Export, Finders and processing custom Crystal reports. These are all present in the new Web UIs as well. All these screens fully support multi-currency and fully honor Sage 300 security. This module offers all the standard G/L screens. From here you can define your G/L Account structure, create and maintain your G/L Accounts and enter your G/L Journal Entries. Generally everything is G/L is based on fiscal year and period (which we provide a specialized control to enter) and allows you to follow GAAP rules exactly. Here you have all the screens to setup and maintain you’re A/R sub-ledger. You have screens to enter and maintain Customers. There are the main document entry screens of Invoice Entry and Receipt Entry. There is integration to SPS for credit card transactions. There is retainage accounting, optional fields, sales tax calculations and all the rich functionality you are used to. Here you have all the screens to setup and maintain you’re A/P sub-ledger. You have screens to enter and maintain Vendors. There are the main document entry screens of Invoice Entry and Payment Entry. 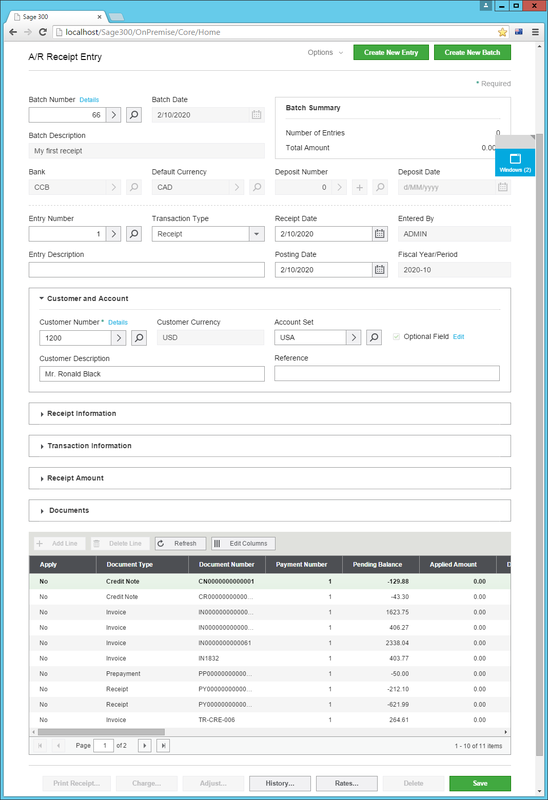 You can track vendor account and transaction details on screen and on printed reports. Accounts Payable produces the reports you need to avoid late payment charges, secure vendor discounts, and match cash requirements to cash resources. There is tight integration to Bank for printing and tracking checks. 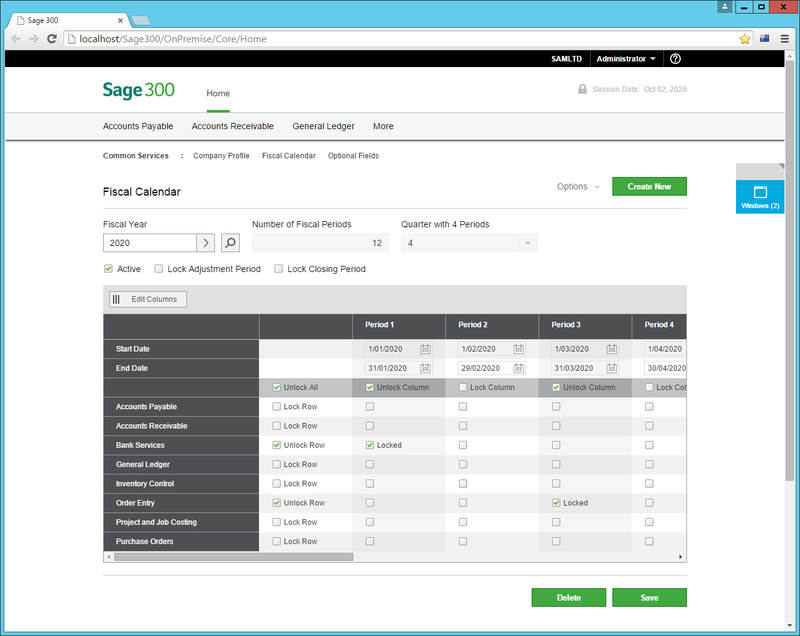 Hopefully you will try out our new Web technology for the Sage 300 UIs. This moves Sage 300 to a fully supported technology platform that continues to evolve quickly. This first release offers lots of functionality across all of Financial Accounting with new releases coming quickly to provide the rest. If you remember our last UI transition from CA-Realizer to VB6, you will see that this one is happening at a much quicker pace. Since the Business Logic is still the same as the existing product, you know that this is a very full featured and robust set of accounting functionality that has been in use at a great many companies for quite a few years now. For more information check out the online help at: http://help.sage300.com.